A refractometer is a nifty brewing instrument that allows a gravity reading to be taken with just a single drop of wort. It beats wasting 6-8 ounces for a hydrometer sample. The drop of wort is spread across a flat lens with a clear plate that snaps down over it and uniformly spreads the fluid. 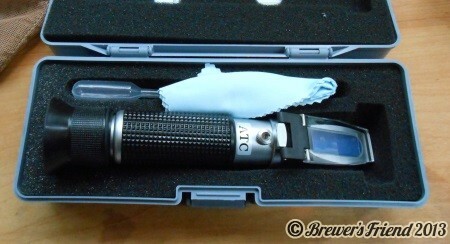 The refractometer is then held up to a light source and you look through it, sort of like a telescope. Update 6/14/2013 – the unit pictured here is cheap made in China version off Amazon for $40. With refractometers, you get what you pay for. Check out our evaluation of the PAL-1 digital refractometer if you want to see what a top of the line model looks like. Refractometers need to be calibrated with water to read zero. Calibration may be necessary before each use. IGNORE the SG scale if your model has it – only pay attention to the Brix scale. The relationship between Brix and SG is not linear! Like hydrometers, refractometer readings are temperature dependent. Some models support ATC – automatic temperature correction, and have varying degrees of success at this. I let my samples cool to below 100F / 37C before using them so I don’t burn myself. Cheap refractometers are not very consistent measurement to measurement from the same wort. I take 5+ measurements then average the value before recording. The variance is +/- 10% either way! What a joke. You get what you pay for and this unit was a gift. The convenience of refractometers comes with a price as refractometers are not as straightforward has hydrometers when it comes to measuring wort gravity. Refractometers measure the angle of refraction as light shines through the solution. They are typically calibrated for sugar water. Wort however has a different density and contains more complex sugars. This throws off the refraction index. Any wort gravity reading from a refractometer needs to be adjusted by a ‘wort correction factor’. For the home brewer, a wort correction factor, specific to the instrument, needs to be determined to accurately measure wort samples. We have complete guide, including spreadsheet for recording measurements, that will help determine your Wort Correction Factor. To help clear up confusion with terminology, at Brewer’s Friend we have decided to call a Brix measurement of wort: Brix WRI (wort refraction index). 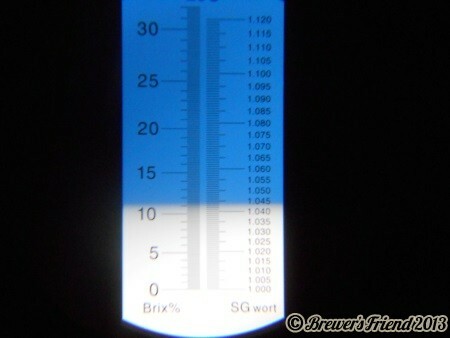 Brix WRI makes it clear the measurement pertains to wort and is unadjusted. Only after dividing Brix WRI by the wort correction factor do we arrive at the actual Brix / Plato reading. It is helpful to know that Brix and Plato are nominally the same to 3 decimal places, so the corrected reading can be treated as Plato (°P). Using a software package like Brewer’s Friend will mitigate the complexities of using a refractometer to a large extent. See our stand alone Refractometer Calculator. 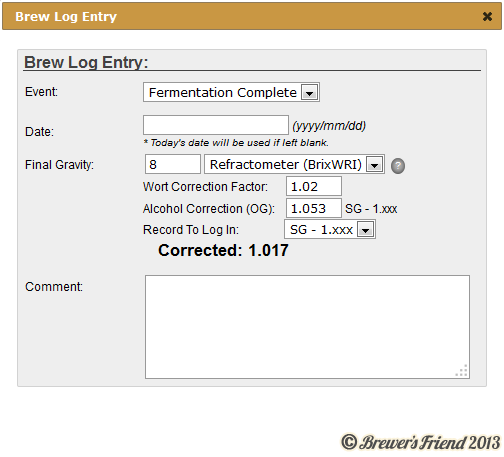 Inside a brew session, the brew log entry screen fully supports refractometer input, including wort correction factor and alcohol correction (if applicable). The wort correction factor is a profile option, and the default is 1.0 (no correction). We have a complete guide with spreadsheet for finding your refractometer’s wort correction factor. It’s a “refractometer” so it measures the angle of refraction, not reflection. Useful to know that it’s nifty, but not more accurate — saves me some money and frees up space to covet other stuff. Thanks!